Chantal was founded in the early 1970’s in Houston, Texas. Originally known for its enameled tea kettles, the company branched out and began to make ceramic “non-stick” cookware in the early 2000’s. As people grew more and more Teflon-averse, Chantal realized that there was a niche for its cookware and began to produce multiple types of pots and pans. Today, with so much competition on the market, Chantal is anything but remarkable. While its pots and pans are visually appealing, they simply don’t perform well enough to justify their above-average cost. They’re certainly usable, of course, but you’re probably better off just getting a low-cost non-stick set from a brand like Wearever. This 7-piece cookware set has a ceramic non-stick coating, glass lids, and steel handles. It’s made from “steel” that has copper and titanium “melted into it.” While it’s actually fairly nice on an induction range, this isn’t the best cookware set for a normal gas or electric cooktop. Unlike other cookware sets, this Chantal line doesn’t use the right kinds of materials in its construction. This means it’s actually pretty bad at conducting heat, at least compared to a cheaper aluminum set. The primary advantage it offers is the fact that it’s magnetic, which means it’ll work with an induction stove. Because of how induction works, you don’t really care what your pot or pan is made out of in terms of thermal conductivity. The heat starts out in the pan, so there’s no need to transfer it anywhere. Chantal says that copper is “melted” into these pots and pans, which is a fancy way of saying that they use a steel alloy. I’m not a metallurgist, so I’m not 100% sure on what the properties of this steel/copper/titanium alloy are, but I do know that it stinks at distributing heat. Objective tests suggest that these pots and pans conduct heat about as well as cast iron, which is famously terrible at heating up evenly and quickly. On the other hand, cast iron stays hot for a long time after you heat it up, which is nice for some types of cooking. 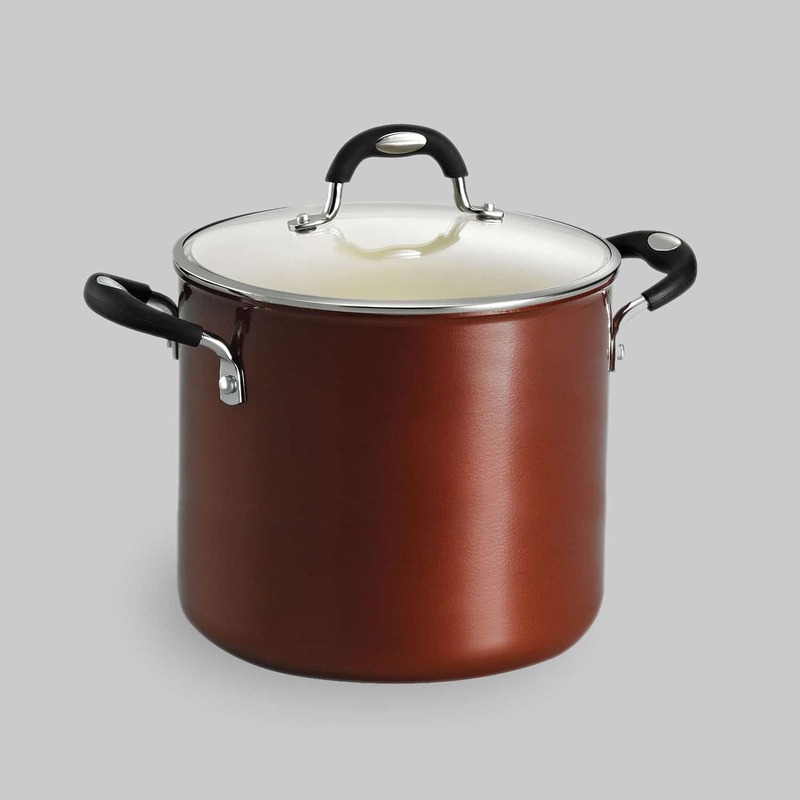 While Chantal is perhaps best known for its enamel-coated cookware, this particular line uses a fairly standard ceramic coating. I say “fairly standard” here because there are two types of ceramic coatings I’ve used: coatings that wear out very quickly (like the ones in Gotham Steel or Red Copper cookware) and coatings that wear out less quickly (like the ones found in T-Fal or just about any other brand that’s not advertised on TV). Chantal seems to have chosen the former, which means the non-stick is susceptible to wear out after only a few months of use. To be clear, non-stick coatings do not last for a long time, period. Ceramic non-sticks (like the one used in this set) are somewhat delicate and can be damaged by heat, cleaning chemicals, and improper use. If you don’t use any fat or butter at all, for example, you’ll actually wear out the non-stick coating very quickly. It’s important to read the instructions that come with this set and follow them to the letter if you want it to last for even a medium amount of time in your kitchen. Even with proper care, however, both my testing and other customer reports seem to indicate that this is a remarkably short-lived non-stick. Personally, I’d rather pick up a midrange tri-ply set from a brand like Demeyere or Viking. While non-stick cookware makes cleanup a bit easier, the amount of work you need to do to get this coating to last is simply too high. I’d rather scrub a pan clean than season one once a week, which seems to be the only way to make this coating last. Besides, a high-quality tri-ply set from another brand will often be cheaper, will last basically forever, will be equally compatible with induction, and will have better heating on a non-induction range. In other words, it’s a clear winner in just about every way. The primary disadvantage to both ceramic and Teflon-style non-stick interiors is the fact that they won’t last. This set solves this problem in a somewhat unusual way. Rather than using a normal non-stick material that effectively prevents food from sticking, these pots and pans have an enameled interior. This makes them last more-or-less forever in your kitchen — or at very least, least the interior coating won’t wear out. If you’ve ever cooked on enamel before, you probably know that this comes with its fair share of downsides. These pots and pans are heavy, the coating can chip if they’re dropped or something heavy falls on them, and most importantly, they’re not very non-stick. Sure, cleanup is different than cleaning stainless steel, but you definitely can’t cook eggs in these the same way you could on Teflon or Thermolon. Instead, you get a smooth surface that’s especially responsive to some unusual cleaning techniques. The easiest way to clean these pots and pans is to fill them with water, boil the water, and then rinse them out when they cool. The physical action of boiling the water is more than enough to loosen any food particles and make your cleaning task a breeze. You can also use other enamel-specific techniques, like mixing vinegar in with the water to clean out tough stains. 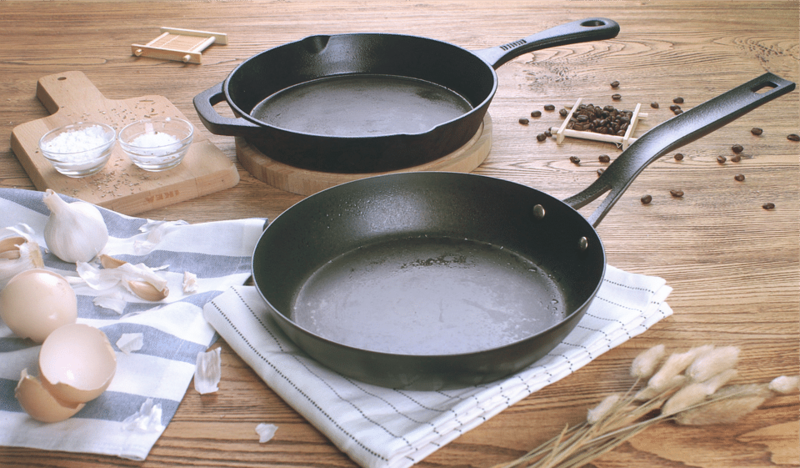 As far as heat goes, these pots and pans are more comparable to cast iron than tri-ply. This means that they hold heat pretty well, but they heat up slowly and unevenly. This isn’t a total dealbreaker — many people prefer cast iron for their normal cooking, after all — but it’s certainly a black mark in my book. I like my cookware to quickly rise to the temperature of my burner and cool off just as quickly. Again, I’m not sure that this cookware set is worth buying over a tri-ply set from Kirkland or All-Clad. It’s certainly unique, but the cast-iron-like thermal characteristics and involved cleanup make it fairly unappealing as far as I’m concerned. If you think you want to give enamel a try, however, there’s nothing wrong with it. You can still cook some pretty amazing things on these pots and pans. If you’re not interested in buying a whole set, try getting a single pan. This 11-inch skillet is perfect for browning meat and making a pan sauce afterward. It’s not an egg pan, of course, due to the fact that enamel is somewhat sticky. It is, however, somewhat easier to clean than stainless steel in some circumstances. Just like the sets above, I’d compare this to a cast iron skillet when it comes to heating. If you’re a cast iron kind of a person, there’s nothing wrong with this. Just bear in mind that this pan will heat slowly and cool off just as slowly. You’ll want to preheat it for a little bit before throwing on food. You’ll also want to make sure that you use it on the right size burner in order to actually get the edges of the pan hot. Otherwise, you’ll have a lump of heat in the middle and a lukewarm pan everywhere else. 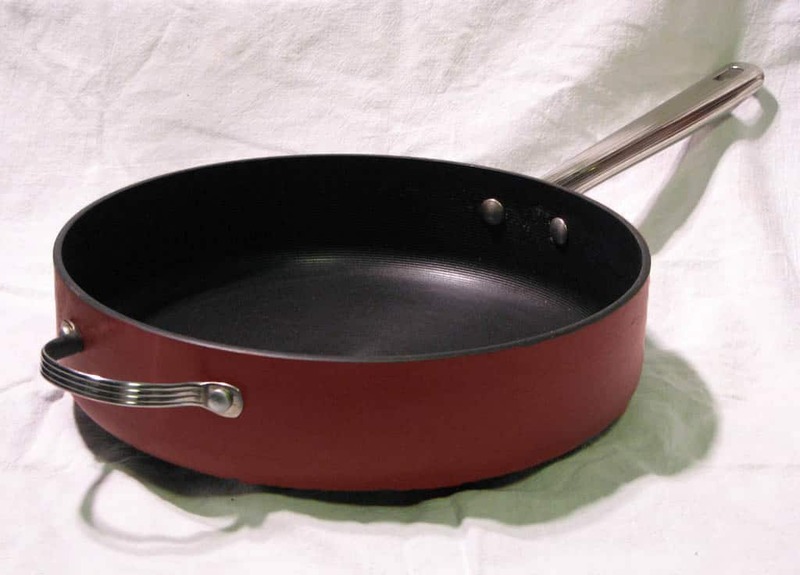 While this pan is quite pricey, it’s very durable and totally chemical free. It’s an interesting way to have a slightly non-stick piece of cookware that will last for years. Personally, I’d probably choose a tri-ply pan instead, but that’s me. Chantal is probably most famous for its enameled tea kettles, so I felt like I should talk about at least one of those here. 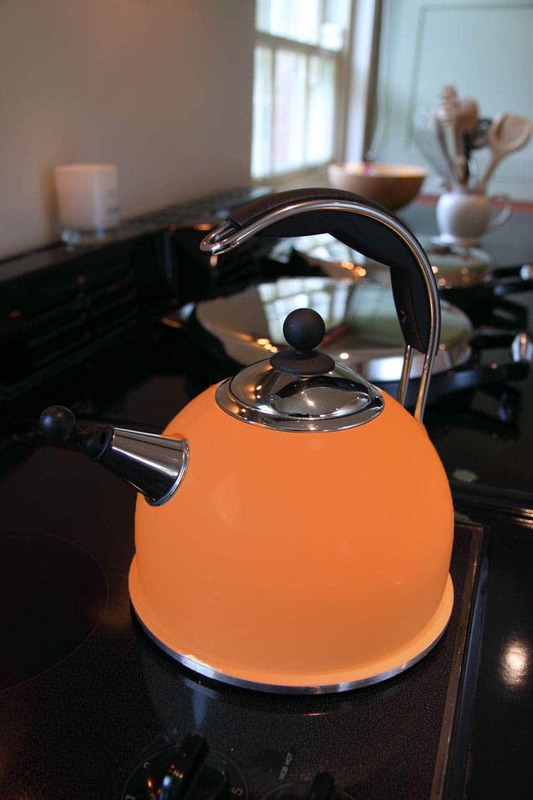 Their kettles are quite affordable, very high quality, and designed to be very easy to use. They work on both induction and traditional stovetops and have a handy whistle that tells you when the water is boiling. While the enameled exterior of these kettles speaks to a simpler time, Chantal has thoughtfully included ergonomic composite handles that don’t heat up while you boil your water. This means that you can easily pour a cup of tea or make an instant lunch without using a potholder. It’s a nice design decision that helps to cement Chantal’s place as a teapot market leader. In other cookware, I’d mention that steel isn’t an ideal material due to how slowly it heats up. With this kettle, however, that isn’t a big deal. The difference in straight boiling time between a stainless steel kettle and an aluminum one isn’t huge. Besides, you’re just putting this on the stove and walking away until it whistles, anyway. What’s a minute or two of extra boiling time going to hurt? 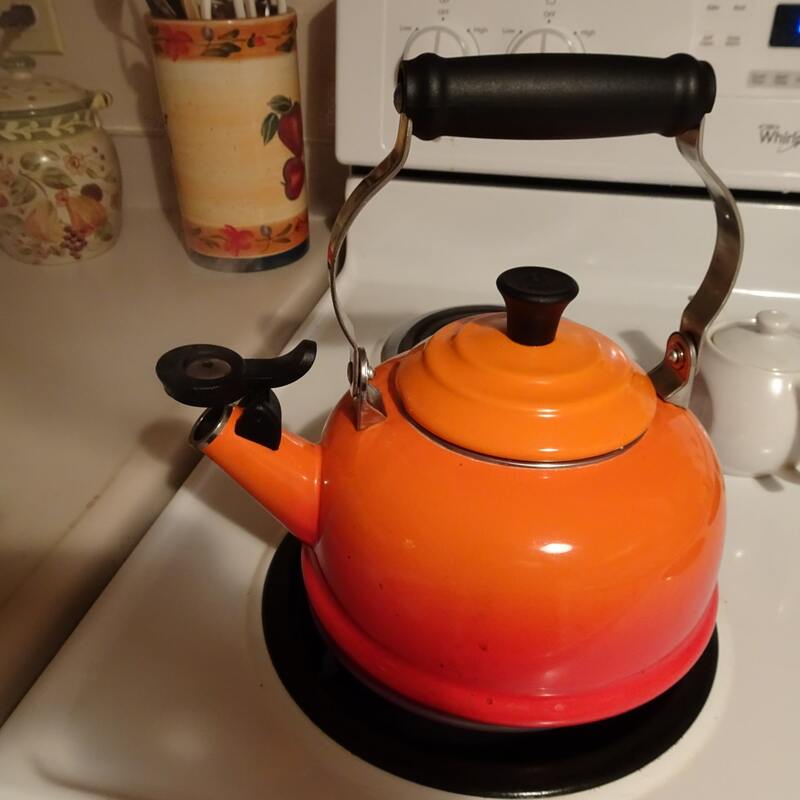 If I was in the market for an enameled tea kettle, I’d absolutely start by looking at this Chantal kettle. It’s not as fancy or ornate as some other options you can find, but it’s affordable, durable, and very convenient to use. If you’re interested in function over form it’s quite tough to beat this kettle. This 8-inch frying pan is made from the same alloy as the ceramic non-stick cookware set above. It features the same non-stick coating, making it a somewhat acceptable egg pan for a few months. Just like the non-stick set above, however, it’s a bit of a pain to care for this particular ceramic coating. I’d personally recommend that you just pick up the cheapest non-stick frying pan you can and use that for eggs instead. Try a Guy Fieri pan if you want a vibrant exterior, or consider Ballarini for something a bit more drab. Overall, while Chantal cookware has the advantage of being induction compatible, I’m not a fan of their design choices. Their non-stick ceramic lines don’t last very long, and most of their cookware seems to be closer to cast iron than aluminum in terms of thermal performance. It’s fine to have a slow-heating frying pan or two, but you’ll start to have a problem when every piece of cookware in your kitchen is slow to respond to changes in burner temperature. This makes it very difficult to precisely control a simmer or even cook meat without burning it, especially since the pots and pans take so long to heat up. You often won’t realize that your burner is too hot until you’ve already burned your food. Of course, this second issue isn’t a big deal with induction. 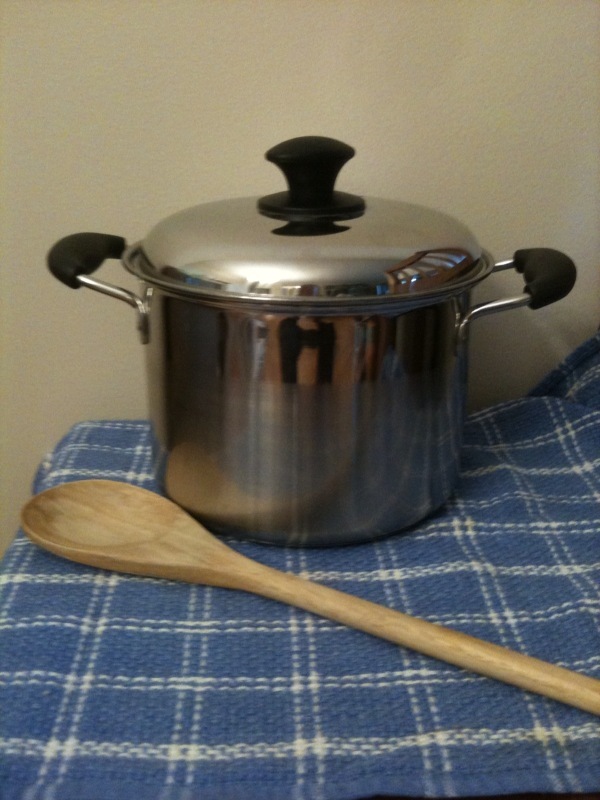 Induction works by using magnetic magic to simply force your pot or pan to be at the temperature you want. It’s a little more complicated than that, of course, but it works pretty close to that in practice. This means that Chantal cookware is a reasonably okay buy for anyone with an induction range. When it comes to teapots, however, I’m a big fan of Chantal. Their enameled teapots are very well designed and come with all of the features a regular tea drinker could want. A Chantal teapot is a classy way of preparing water for anything you can think of, including tea, pour-over or french press coffee, instant lunches, and more. 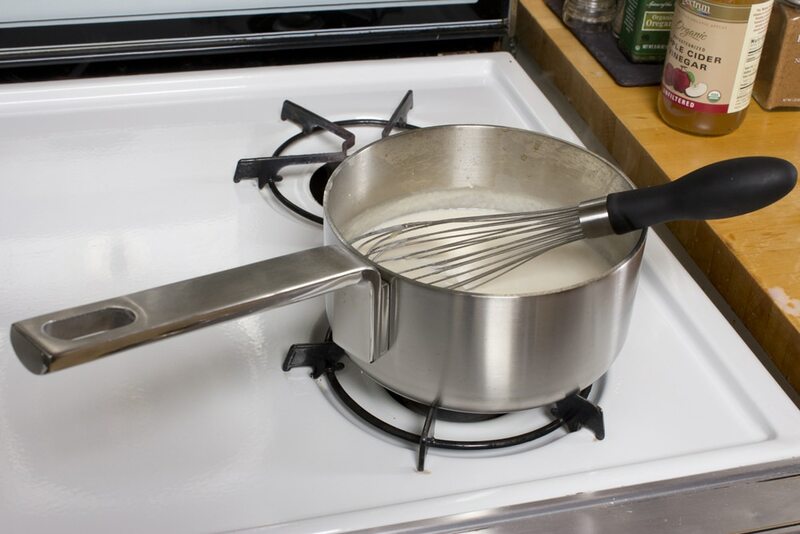 If you don’t have an induction range, be sure to look at other brands before you buy Chantal. If you do, make sure you understand how the cooking surface will actually perform. Chantal’s non-stick ceramic is fairly short lived, and while its enameled pans will last for a long time, they’re not particularly non-stick or easy to clean. Finally, if you want a teapot, consider Chantal first! Their well-made teapots are a great starting point for your search.